Sarah's Marble Cake Light. 1 cup butter 3 cups white sugar 1 cup sour milk 5 cups flour whites of 8 eggs 1 teaspoon soda. flavor with lemon. Dark 1 cup butter 2 cups brown sugar 1 cup molasses 1 cup sour milk 4 cups flour yolks of 8 eggs 1 teaspoon soda ditto of cloves, cinnamon & nutmeg. Aunt Lucys Fruit Cake. 1 cup butter 2 cups sugar 4 & 1/2 cups flour 1/3 cup sour milk 3 eggs 1 cup raisins chopped 1 lb raisins 1 lb currants 1 lb citron 1/3 cup molasses 1 table spoon nutmeg ditto of mace, cinnamon, 2/3 ditto of cloves 1 small teaspoon of soda. 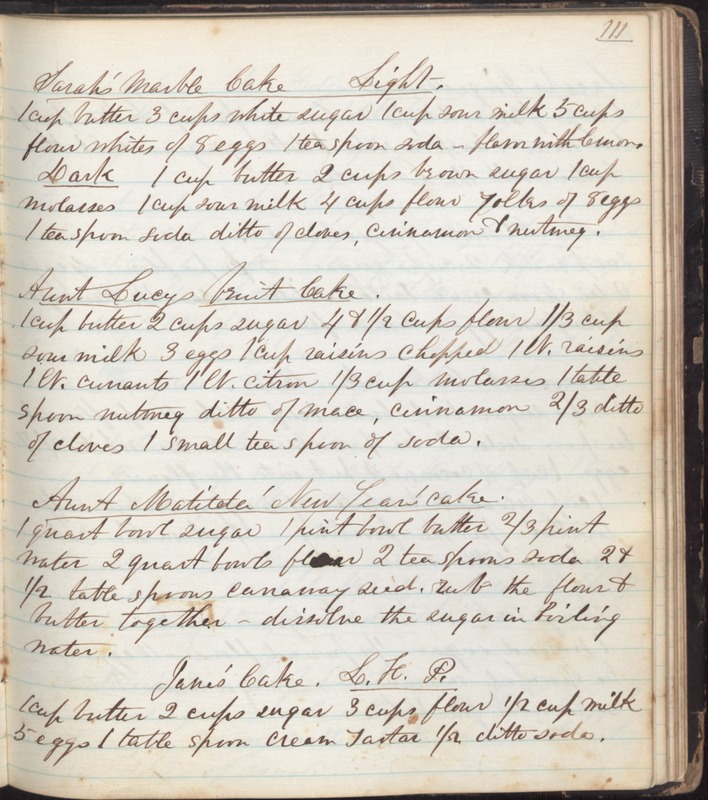 Aunt Matilda' New Year's cake 1 quart bowl sugar 1 pint bowl butter 2/3 pint water 2 quart bowls flour 2 teaspoons soda 2 & 1/2 table spoons carraway seed. Rub the flour & butter together - dissolve the sugar in boiling water. Jane's Cake. L.H.P. 1 cup butter 2 cups sugar 3 cups flour 1/2 cup milk 5 eggs 1 table spoon cream tartar 1/2 ditto soda.